The star spent much of Christmas Day in a cell after he apparently attacked Brooke Mueller Sheen when she asked him for a divorce. Arrest papers quote Mrs Sheen saying the Two and Half Men star had straddled her on a bed and held her down. The 44-year-old denied threatening his wife with a knife or choking her. 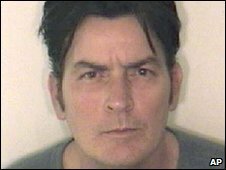 According to the police document, during the attack, Sheen said: "You better be in fear. If you tell anybody, I'll kill you. "I have ex-police I can hire who know how to get the job done and they won't leave any trace." However, the star told officers they had slapped each other on the arms and he had snapped two pairs of her eyeglasses in front of her. He also told officers that he had become "very upset with this threat [of divorce] because of prior experiences." He went through a bitter divorce and custody battle with his previous wife, actress Denise Richards. An ambulance went to the house, but no-one was taken to hospital. Police on Saturday said the star was suspected of assault, menacing and criminal mischief. He was released on $8,500 (£5,300) bail. Mr Sheen is the son of actor Martin Sheen and brother of actor-director Emilio Estevez. He married Brooke Mueller Sheen, a property investor, in 2008. She gave birth to the couple's first children, twin boys, in March.